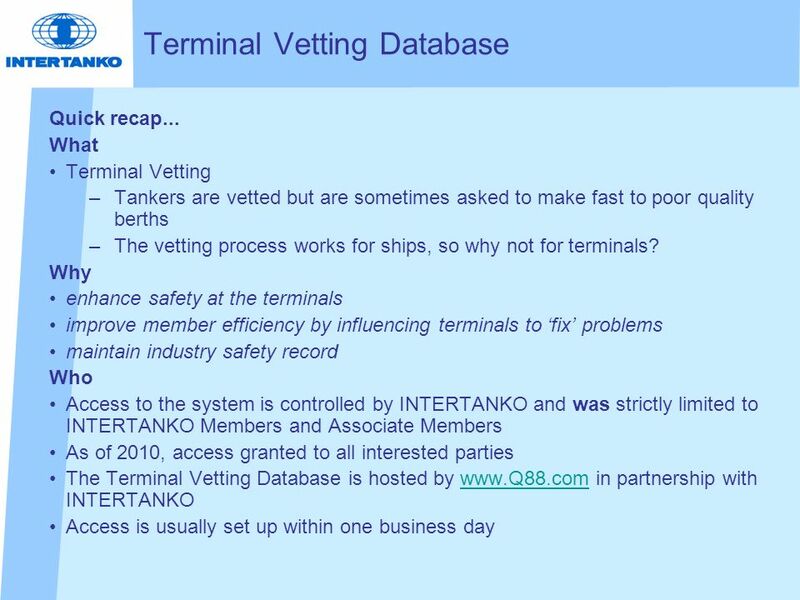 INTERTANKO Update on Terminal Issues Introduction to the Terminal Vetting Database – access all areas OCIMF APTF 16 Singapore 18-19 February 2010. 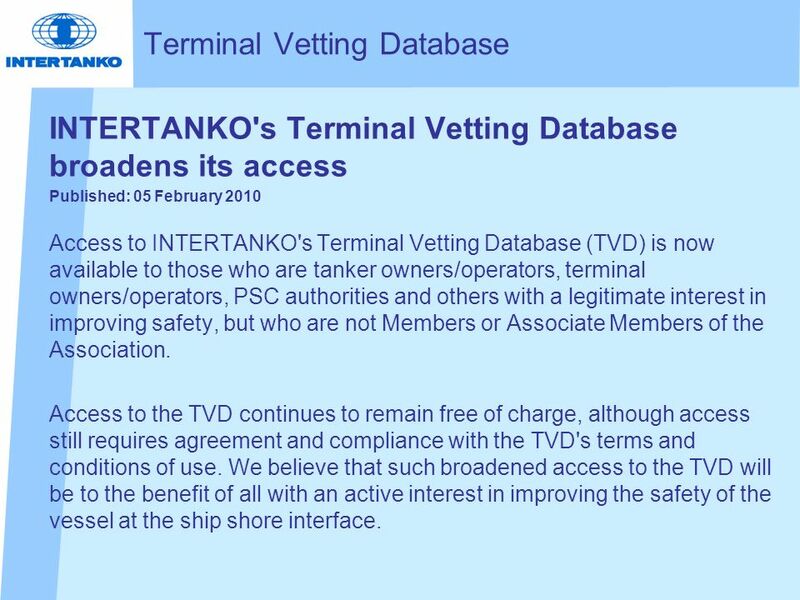 3 INTERTANKO's Terminal Vetting Database broadens its access Published: 05 February 2010 Access to INTERTANKO's Terminal Vetting Database (TVD) is now available to those who are tanker owners/operators, terminal owners/operators, PSC authorities and others with a legitimate interest in improving safety, but who are not Members or Associate Members of the Association. 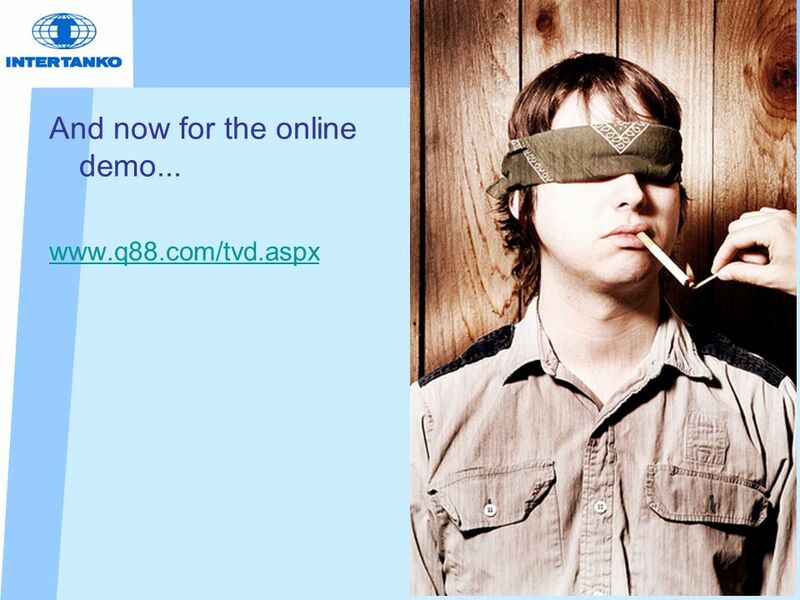 Access to the TVD continues to remain free of charge, although access still requires agreement and compliance with the TVD's terms and conditions of use. 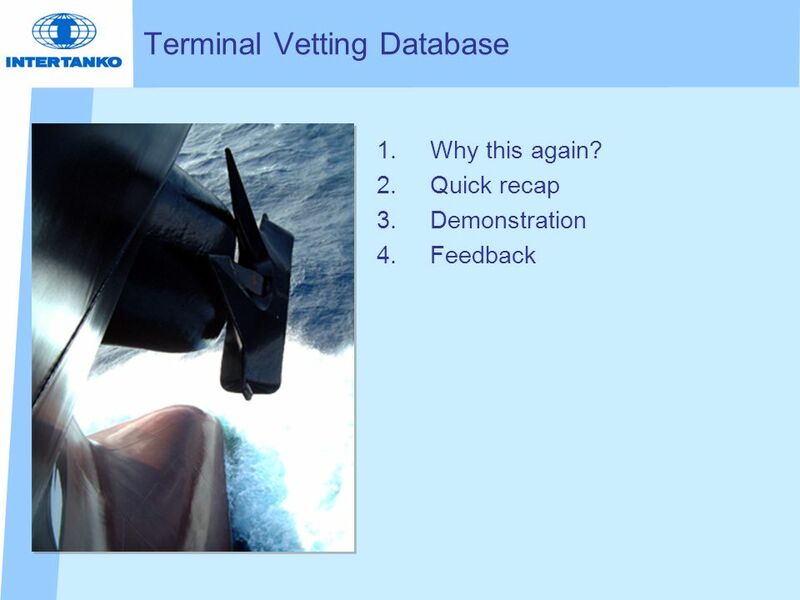 We believe that such broadened access to the TVD will be to the benefit of all with an active interest in improving the safety of the vessel at the ship shore interface. 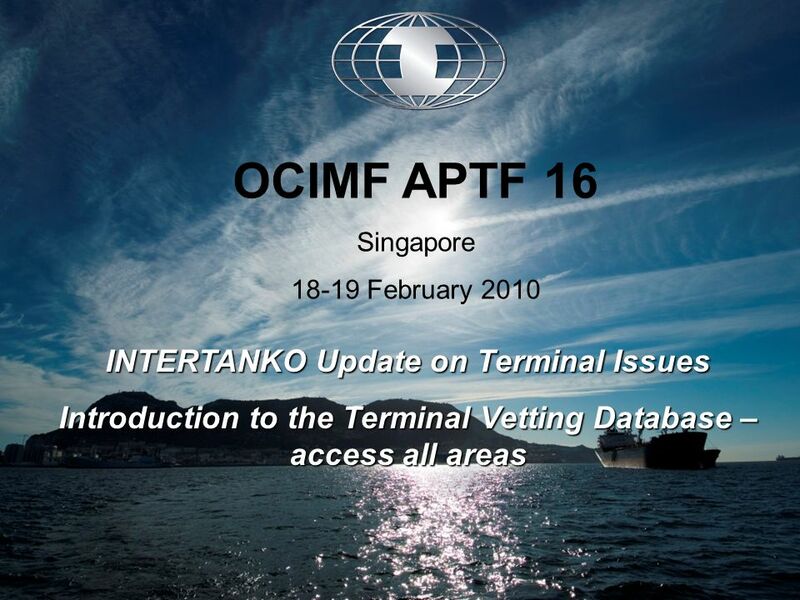 Download ppt "INTERTANKO Update on Terminal Issues Introduction to the Terminal Vetting Database – access all areas OCIMF APTF 16 Singapore 18-19 February 2010." Q88.com Presentation INTERTANKO North American Panel Meeting March 22, 2004 Fritz Heidenreich President Heidenreich Innovations Inc.
SPS Information Management System (SPS IMS) An introduction Workshop on Transparency, October, Geneva. © Experian Limited All rights reserved. Experian and the marks used herein are service marks or registered trademarks of Experian Limited. Other. Niagara Portal Introduction January 2007 Scott Muench - Technical Sales Manager. Freedom – MuniciPAY Credit Card Interface 1Freedom Systems – MuniciPAY Credit Card Interface Webinar WELCOME TO THE FREEDOM – MUNICIPAY CREDIT CARD INTERFACE. © © QA Software Pty Ltd All rights reserved 1 Project Information Management Tools Inspection and Defects Management System for Projects By QA Software. Page 1 of 30 This process involves authorizing a company to act on behalf of the designated representative for a Crown petroleum and natural gas licence. The New MICCS Certification Program An Introduction to the Enhancements and Updates of the MICCS Certification Program. 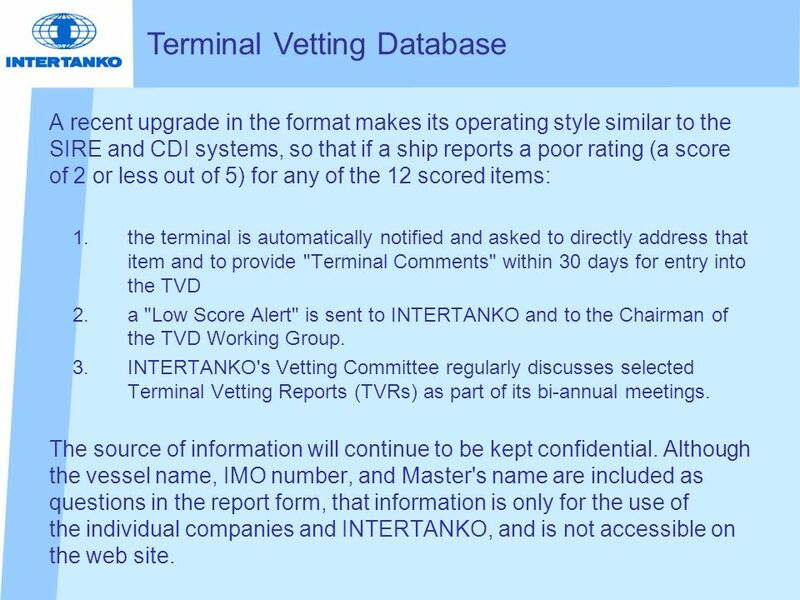 Intertanko Vetting Seminar Geoffrey Snow SIRE Programme Manager. Presentation by Gunnar A. Knudsen Manager, Ports and Terminals Section for Andromeda Shipping (India) Mumbai, 28 November 2003. 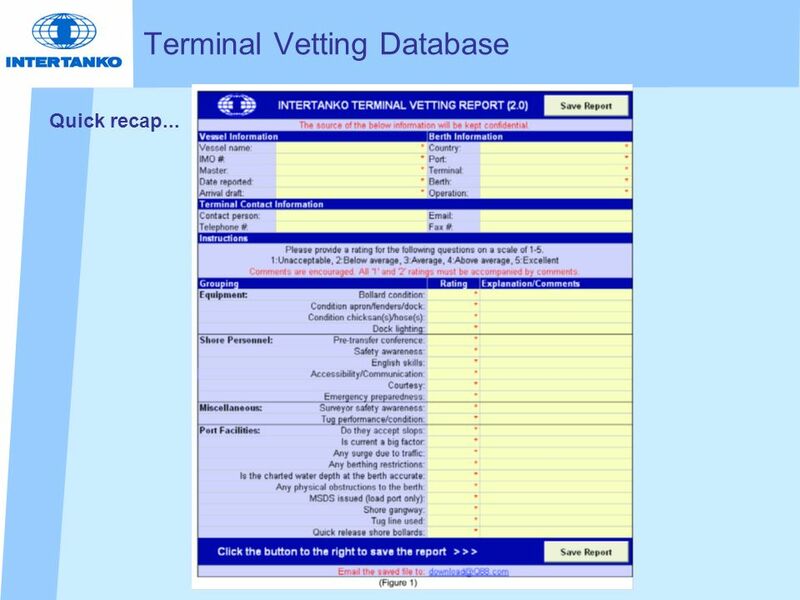 VETTING & ASA SERVICES ' Analytical Systems by Adnavis ’ for Appraisal of Ship Inspection Reports Jean-Philippe GOBILLON ADNAVIS CEFIC Workshop Good Practices. Records Management Committee BOS Presentation February 1, 2005.